These are some of the common causes of Unrecoverable Errors and the codes that may come with it. Due to the random nature of the errors, the error number you get may differ from what is shown. The list is not inclusive and you might encounter a different error from the scenarios given. Select Send every time you receive the unrecoverable error. The information gathered from this can help Intuit create patch updates to improve the program. Note: If you don't use a user name to open your company file or if there are no other users that can access your company file, proceed to solution 2. Identify how many users are affected by using a different log in credential to open the same company file. If the error only happens in one specific user, that user credential might be damaged. If so, recreate the damaged user. From the Company menu, select Set Up Users and Passwords > Set Up Users. Enterprise users: Go to the Company menu, then select Users > Set Up Users and Roles. Select Add User..., then type the user name and password. Select Next. Note: Do not use the damaged user name. Hold the Ctrl key until the No Company Open window shows. Select the desired company file from the No Company Open window. Press and hold the Alt key, then select Open. If you are prompted for your log in information, release the Alt key, then enter your user name and password. Important: If you are not prompted for your user name and password, do not release the Alt key. Press and hold the Alt key, then select OK. Do not release the Alt key until your file is completely open. 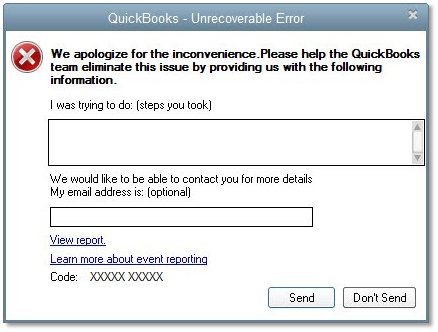 Note: QuickBooks will display a blank screen. If you can highlight a QuickBooks menu by just hovering your pointer to it, your company file is completely open. 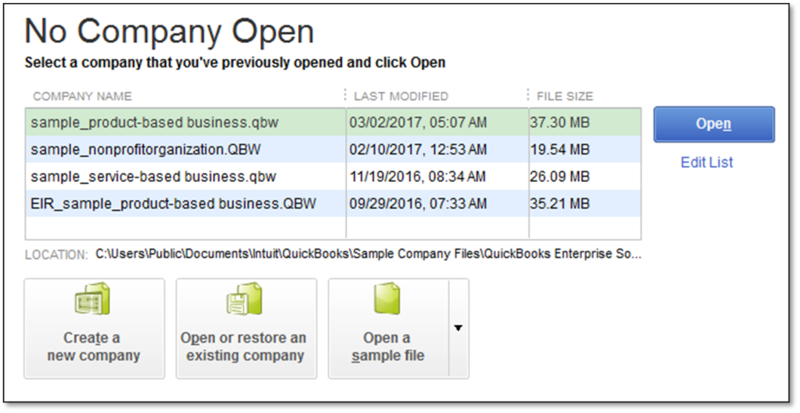 Opening a sample company file helps you identify if the problem lies with your company file or with QuickBooks itself. If the sample file opens, your company file may be damaged or the folder where the company file is saved is damaged. Try copying the file to a different location. If the error persists, use a recent backup or ADR to restore your file. Perform basic data damage troubleshooting if your backup or ADR is not enough to get you back on track. If the sample file produces the same error message, proceed to solution 4. From the No Company Open window, select Open a sample file. Select any sample file on the list. Copying and opening the company file from a different location can identify if the folder where the company file is saved is damaged or "too deep" where it exceeded the file system path limitation. If you receive the same error after moving the company file in a different location, the company file or your QuickBooks installation is probably damaged. Right-click anywhere on your Desktop, then select New > Folder. Name the folder QBTEST. Paste the company file in the QBTEST folder that you created. Open the company file from the QBTEST folder. Running reboot.bat re-registers the QuickBooks related .DLL and .OCX files which can help address unrecoverable errors. Download and run the QuickBooks Install Diagnostic tool. Manually repair Microsoft components. If you are not comfortable with these steps, consult an IT Professional or Microsoft. Select the Start menu, then choose Settings > Accounts > Family & other users. Select I don't have this person's sign-in information, then Add a user without a Microsoft account. Enter the name of the new account, then select Finish. Recommended: Assign a password to the new account to ensure security. Select the newly created account, then choose Account Type. To open the Run window, press Windows+R on your keyboard. Select User Accounts > Manage another account > Other accounts > Add an account. Choose Sign in without a Microsoft account (not recommended), then select Local account. Enter the user name, password, and password hint, then select Next. The screen will return to the Manage Other Accounts screen. Select the newly created account, then Edit. By default, the new user is set to standard user. From the drop-down menu, select Administrator. Select User Accounts, then Manage another account. Choose Create a new account, then type in the name of the new account. Select Administrator, then Create Account. Note: Servers are usually maintained by licensed computer technicians. Consult your IT professional before following the steps in this section. Expand Local Users and Groups, then select Groups. Double-click the Administrator Groups to open the Administrator Properties window. Select Add. In the Select Users, Computers, Service Accounts or Groups window, enter the account you want to add to the local admin groups. Select OK.
Run the Windows SBS (2011/2008) console. Select Users and Groups, then go to the Users tab. From the Tasks pane, select Add a new user account to run the Add a New User Account wizard. Enter the details, then select the role for the new user. Note: You will not be able to continue without adding a password. The password must meet the complexity requirements. Follow the rest of the instructions, then select Finish.